I love tennis, but it wasn’t love at first sight for my kids. Tennis rules and terminology can be confusing and frustrating at first. Besides, tennis is hard, and it takes awhile to play well enough to have a satisfying game. At first, when I suggested tennis, I got whines and protests. But I persisted because I really wanted my kids to learn when they were young, so they’d have a strong foundation of skills; I also looked forward to the day when we could go out and enjoy an afternoon of family tennis. And guess what? Now we can. It’s not Wimbledon-worthy tennis, believe me, but we have some decent rallies, and everyone has a good time. If you want to get your kids (happily) out on the courts, my advice is to take it slow, keep it fun, and help your children develop genuine interest in the game before trying to perfect their skills. Here are some tips that worked for me. Tennis won’t be any fun if you don’t teach your kids the absolute basics, such as how to properly hold a racquet or how to approach the ball. To make sure you’re teaching the best techniques, check out some of the many books on teaching kids tennis. Consider purchasing beginner tennis racquets (these are lighter weight than the standard racquet) so your kids will get used to holding the racquet and swinging. You might even be able to find one in their favorite color or featuring their favorite tennis hero to add interest. Choose a customized tennis bag to make it a trip to the courts a special occasion. Also be sure to buy some foam balls and some compression balls as they are better suited for beginners just learning how to play the sport. Get a lot of balls as many are sure to go missing. This is all you need the first few times you go to the tennis courts, besides water and snacks. I recommend short practice periods the first few times you go. Give your kids racquets and balls and let them hit the ball back and forth without too much advice or instruction from you. I don’t recommend buying pricey tennis clothes for kids who are just starting out and still growing. But your child does need to wear a proper pair of tennis shoes to avoid injury. Running shoes are strongly discouraged as they aren’t designed to be sturdy during lateral movements. A tennis hat is another essential, and be sure to pack sunscreen, too. 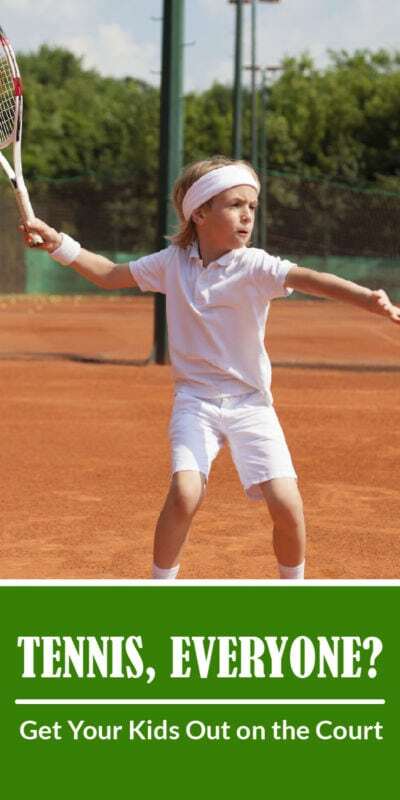 If your kids catch the tennis bug, eBay is a great place to find reasonably priced tennis shirts, shorts, and skirts. Your child may also be inspired by a T-shirt or other memento honoring tennis greats like Serena and Venus Williams, or Roger Federer. You don’t need to drive to a tennis court in order to practice tennis, especially when just starting out. Invest in an at-home tennis net that you can put in your backyard or driveway. You can also buy an automatic tennis ball pitcher or a tennis trainer (basically a tennis ball on a retractable string) so that your child can simply practice hitting the ball and making contact with their racquet. 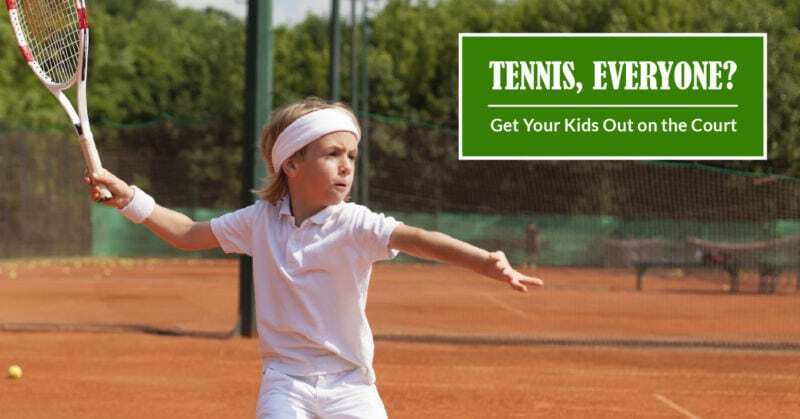 Make skill building fun by introducing your kids to tennis games. Show your kids how to play “Frying Pan” by bouncing a ball off the racquet as if it were a hot piece of bacon flying out the pan. See how long you can go without letting the “bacon” (ball) touch the ground. Books on teaching kids tennis will give you other ideas for tennis games to play with your kids. Badmitton and ping pong will also help your kids develop hand-eye coordination and racquet control. Your children will enjoy tennis more if their friends are playing, too. Check with your local rec centers to see if they have a youth tennis program, and if they do, check into getting a group rate for your kids and their friends. Tennis has a lot of benefits for kids physically, mentally, and emotionally, so your local school may be interested in developing a youth tennis program. Remember that tennis is a game, and your children are is far less likely to get burned out if it’s play, not drudgery. Introducing your kids to tennis themed children’s books, coloring books, and dolls will enhance their interest in the sport; so will watching tournaments like Wimbledon and the U.S. Open with you on television. As their skills improve, try to find tennis teachers and summer tennis camps they enjoy. If you’re patient and encouraging, you’ll have no problem passing your love for tennis on to your children. Once they pick up the game, make time to play as a family whenever you can. I never thought about tennis for kids. This would be fun. My sister and I used to play tennis as kids, and we had so much fun doing it! I have never played tennis but I think it would be great exercise. Perfect outdoor activity for kids!